The quality of your supplies can make or break the finished look of any paint job. To select the tools for success, start with this shopping guide. 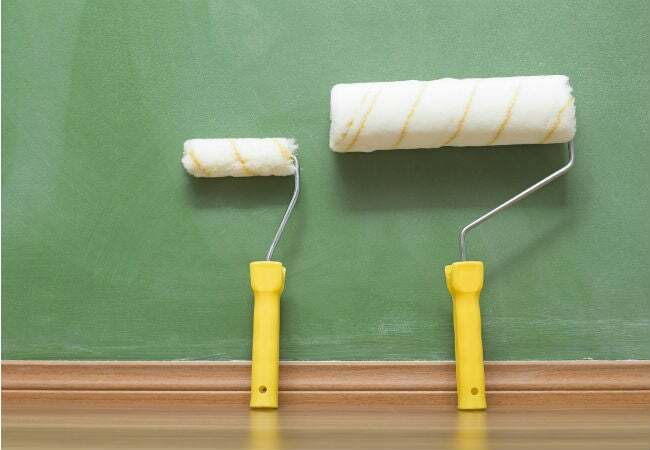 There are many do-it-yourself projects that allow for scrimping on costs without any negative effects on your results—painting, however, is not one of them. If you want professional-looking results, you need to start with quality supplies, including paint, paintbrushes, and paint rollers. 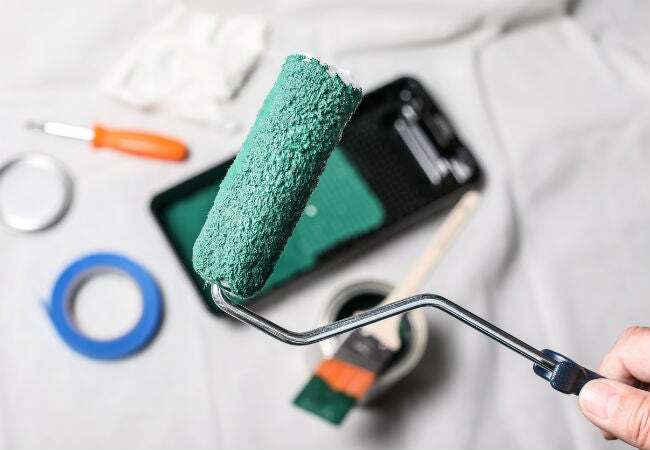 You’ll likely reach for a paintbrush when cutting in or painting trim, but covering the bulk of the wall or ceiling with paint becomes a much simpler, speedier job when you use a paint roller. Not only that, but the right roller spreads paint smoothly and evenly, so you aren’t left with brushstrokes, patchy spots, or other imperfections. While picking up the best paint roller at the store sounds simple enough, the crowded aisle of roller frames and covers can overwhelm. If you start with the following guide, you can streamline the decision-making process. We’ve outlined what to keep in mind when finding the right tool and even combed through feedback from fellow DIYers to find the best paint rollers for superior results on your next paint project. 1. Select an easy-to-grip roller frame. 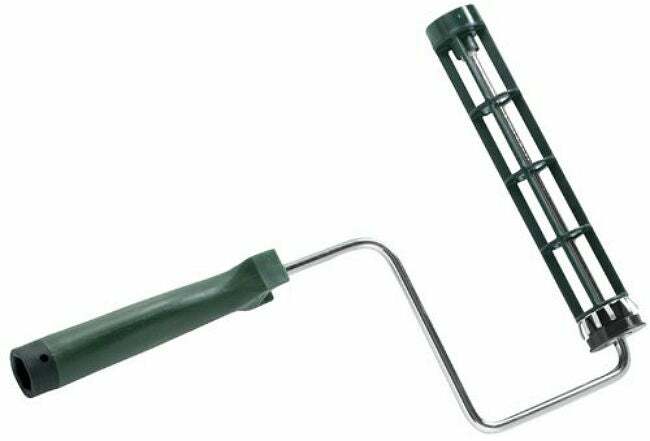 A roller frame—the skeleton of this reusable painting tool—is basically a comfortable plastic handle connected to a roller cage (the part of the frame that slips inside the roller cover). Typically, roller cages have plastic caps at either end supporting the compression metal “ribs” that fit inside a cover and hold it securely in place, but you’ll also find roller frames with sturdy plastic cages. Ergonomic handle. If you expect to spend a lot of time painting, even just more than one room, it’s worth paying a little more for an ergonomic handle that is shaped to reduce strain on your wrist. Ball bearings. Quality roller frames have ball bearings to provide smooth rolling movement and a more perfect paint finish. Threaded handle. While it comes on most roller frames, do check for threads or clips at the bottom of the handle so you can attach an extension pole for tackling ceilings or the tops of walls. 2. Narrow down to your options for roller length. Roller frames and covers come in several different lengths (and while most frames come in a fixed roller width, some of the large ones are adjustable in size, using small clips or prongs to secure the cover instead of a cage). You’ll need to match the lengths of your roller frame and cover if you want to do the job right. 9-inch rollers are the best size for the majority of projects tackled by DIYers. For starters, these paint rollers fit easily into a 5-gallon paint bucket. Plus, these are large enough to cover a good size swatch of wall in one roll yet not so long that they are difficult to control around trim and other details. 12-inch or longer rollers can be somewhat heavy and unwieldy and, therefore, are more often used by professionals than DIYers. If you really need to cover a stretch of wall in a hurry, however, you might want to choose one of these oversize rollers. 6- or 7-inch rollers are a good size for painting baseboard molding or small furnishings. These rollers are also useful for getting into corners or reaching behind the toilet to paint the wall. 4-inch mini rollers are great for touchups, small furnishings, tight spaces, or careful work around fixtures, windowsills, or other obstacles. They also come in handy for painting the insides of cabinets or bookcases. 3. Choose the right roller cover material based on your paint and project. Covers come in five common materials, which vary in terms of what paint they work best with, how much they hold, and the texture they create. Wool or mohair roller covers, with natural fibers, are the best choices for applying oil-based paint, but they work well with any finish and cover a variety of surfaces smoothly. Wool picks up a lot of paint, and so provides excellent coverage with just one coat. Synthetic roller covers—including polyester, nylon, or Dacron—are the right choice for water-based latex paint because they resist matting. You can use a synthetic cover with any paint finish and on most surfaces. Though synthetics don’t pick up and hold as much paint as wool does, they are generally very durable. 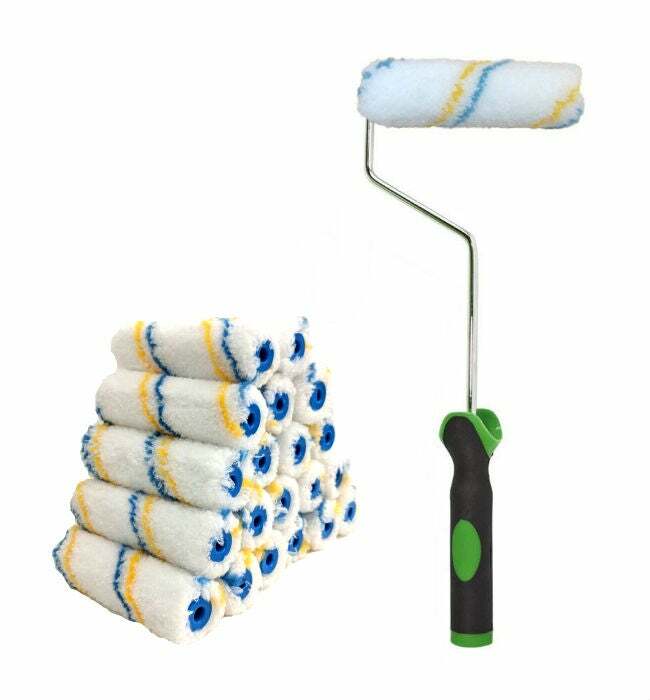 Roller covers that blend wool and polyester can be used with either type of paint and any paint finish, so are a great choice if you often switch between oil-based and water-based products. These versatile roller covers give the best of both worlds: They pick up a lot of paint and last a long time if cared for properly. Newer to the painting scene, microfiber roller covers (identifiable by the diagonal stripes on the plush cover) work with latex as well as oil-based paints with a matte, eggshell, or satin finish. These rollers provide a very smooth finish, almost as if sprayed on, and are suitable only on surfaces without much texture. However, there’s a bit of a learning curve to achieving an even finish with a microfiber roller because they pick up and release more paint than the average cover, so practice on cardboard or another throwaway surface before tackling your walls. Foam roller covers don’t last as long as the other options and, for that reason, are sometimes considered “single use” covers. They are best for rolling semi-gloss or high-gloss latex paint over smooth—not heavily textured—surfaces. Use them for quick touchups on trim, baseboards, furniture, or other small projects. You’ll also want to consider the core of the roller cover; a good one is made from some type of resin or plastic. Cheap rollers have cardboard cores, which don’t hold well and often come apart after just a few uses. 4. Know what nap you need for your surface. The nap of a roller cover refers to the length of its fibers—yet another important decision to make based on the project at hand. Different naps are good for different surfaces. As a general rule, the shorter the nap, the smoother the surface you’ll use it on. Using a long nap on a smooth surface tends to create a bumpy finish, while a short nap on a rough surface will often tear apart or shed fibers into the paint. ¼-inch nap is best for very smooth walls, ceilings, cabinetry, and other surfaces without texture, including metal. 3/8-inch nap is good for lightly textured surfaces, including most interior walls. ½-inch nap is a good length for moderately textured walls, paneling, and painted brick or concrete. ¾-inch nap is best for heavily textured surfaces such as bare brick or concrete or textured interior walls like popcorn-textured ceilings. 1-inch nap and above is useful for painting stucco, cinder blocks, or rough brick. Looking for the best paint roller? Look no further. These roller components—a versatile frame, a standard roller cover, and reliable mini roller covers—not only meet our standards but they also win raves from DIYers who spend a lot of time painting. A quality roller cover deserves a quality frame, and that’s just what you get with Wooster Brush. The molded grip feels good and stays secure in your hand, while the fiberglass cage has a quick-release spring that keeps your roller cover secure while you’re working, then releases it with a tap when you’re ready to clean up. Use any 9-inch cover with the frame. Available on Amazon in a standard 9-inch size and an equally well-reviewed 4-inch size. At the most versatile length and nap—nine inches and 3/8-inch—this is the roller cover you’ll reach for over and over again. Made of a derivative of nylon, the White Dove cover picks up a lot of paint and rolls it into a lint-free, perfect finish over smooth or lightly textured surfaces. Use it with both oil-based and water-based paints as well as wood stains. One happy DIYer raves, “I highly recommend these rollers. I’ve used them on knockdown texture and on lightly textured walls. I have even painted ceilings with them. They absorb the perfect amount of paint. Enough to coat your walls, but not too much to drop and splatter everywhere. They are worth spending a little bit more vs the cheap ones.” You’ll get a pack of four roller covers. Keep this pack of 20 roller covers on hand for tackling all those small tasks that pop up around the house: touching up walls, painting baseboards or trim, smoothing stain over furniture, or giving a makeover to décor. Made of microfiber, the True Blue Professional 4-inch roller covers have a 3/8-inch nap, making them suited to most lightly textured surfaces. 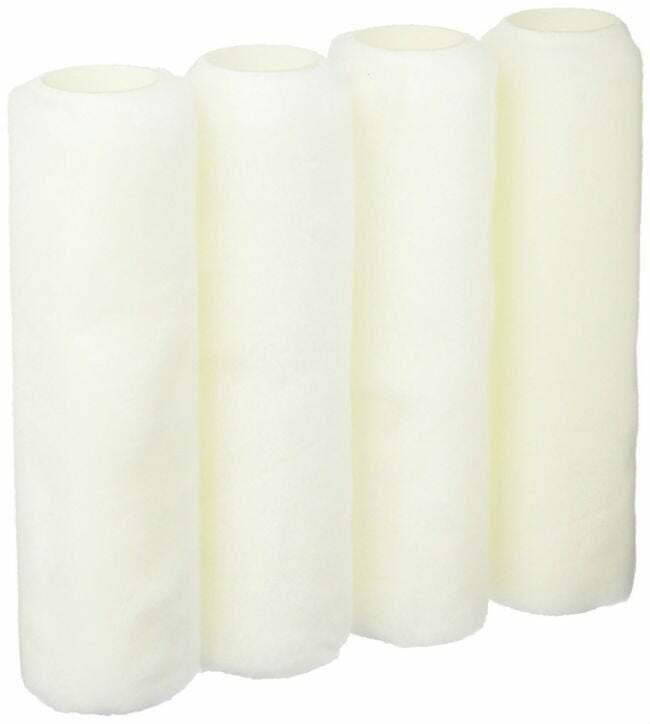 Paint rolls on smoothly, without leaving behind any annoying lint or fibers. Match the roller covers to your favorite 4-inch roller frame.